The strong link between the Sandringham and the Melbourne Football Club's is best captured by the transition of Chris Lamb and Guy Rigoni into Zebras colours for the 2006 season. `Lamby' was drafted to the Demons in the 1998 National Draft at pick 13 overall and played 21 games in Melbourne's defensive half. 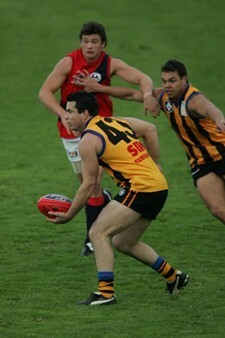 During his time at Melbourne, Lamby played a key role in many Sandy victories including the 2004 Premiership win over Port Melbourne. In the dying seconds, with the ball heading deep towards Port's goals, Lamby rescued the day with a courageous mark right on the goal line. After being delisted by Melbourne at the end of the 2004 season, Lamby spent a year overseas enjoying some well earned time off. Upon arriving back in Melbourne and with a desire to continue his football career, Lamby made contact with the "only Club I would play for" and Sandringham instantly had a new full back. Lamby enjoyed the mateship that existed between the Melbourne and Sandringham players during his days as a Demon and was excited about the prospect of officially becoming a Zebra. When asked to describe the alignment between Melbourne and Sandringham Lamby replied "Sandy is such a great club and it's impossible to separate the AFL from VFL boys at training and on match days as we are all such close mates". Guy Rigoni lists his career highlights as "playing in the 2000 AFL Grand Final and winning back to back flags at Sandy in 2004-05" which further enforces the strong link between these two great Clubs. `Riggers' played over 100 games for the Demons and notched his 50th appearance for the Zebras in last Saturdays Preliminary Final victory against Geelong. Immediately after retiring from Melbourne, `Riggers' signed as a playing assistant coach with Sandringham for the 2006 season. Playing as a hard nosed midfielder, `Riggers' has provided exceptional on field leadership for Sandy's younger midfielders like Valenti and Summers. "The Melbourne blokes take the field as `Zebras' rather than Melbourne reserves players which has enabled Sandy to achieve great success since the alignment began in 2000" Rigoni said this week. Lamb and Rigoni are preparing for another tilt at VFL Premiership glory with the Grand Final against Geelong to be played on Sunday at Princes Park, Carlton. 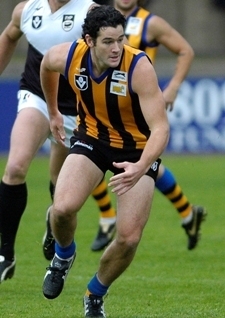 Riggers has already won two flags with the Zebras including a best on ground effort in 2004 when he was awarded the Norm Goss Medal. Lamby was unlucky to miss Sandy's 2000 flag through injury but was an integral member of the 2004 premiership side. Sandringham are recognised as having the best VFL list in the league who will be well complimented with the some of Melbourne's fastest rising stars including Lynden Dunn, Danny Hughes, Nathan Jones and Chris Johnson. Veterans Clint Bizzell and Alistair Nicholson have played important roles in Sandy's season and are hungry for premiership success. Sandringham take on Geelong in what promises to be a great Grand Final, a game many pundits are tipping will be remembered for many years to come. The Zebras are striving to be the first team in more than 20 years to win 3 consecutive VFL Premierships. With a strong contingent of Melbourne listed players and a solid core of experienced VFL players, Sandringham are in a great shape to create history.